So Warren, how old do they have to be before they create their own coat of arms? Or do they? Is it just when they feel they should? And since it's hearldry, there has to be set patterns for HRH's to follow, isn't there? I believe they're 18 when they get their arms. If you scroll all the way down to the bottom of the page, it describes her personal arms and if you go to the pages for all the other members of the BRF it will do the same. Eugenie's arms have thistles in the label because her mother's personal arms contain thistles. Beatrice's have three bees, a pun on her name. 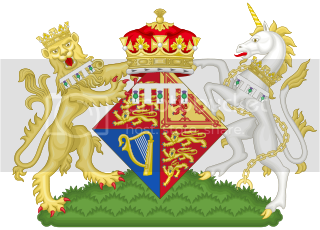 According to what I read, it continues a trend where the charges incorporate elements of the maternal line -- William's arms have an escallop on them, representing the Spencer line. Has Eugenie a boyfriend at the moment? Past the Middleton & Davy stories, there is information on Eugenie getting a summer job. Instead, the history of art student has embarked on six weeks of work experience at art auction house Christie’s. Yesterday a Royal insider said Eugenie, 20, wanted to spend some ‘purposeful time’ experiencing the art world. ‘She has always been interested in that line of work and it fits in perfectly with what she has been studying,’ the friend said. Good on her! I'm glad to see Eugenie using her education in a practical way. I think it will be a good experience for her. Coming from a family not known for their massive work ethic, it was good to see Princess Eugenie fully embracing employment today. The youngest daughter of Prince Andrew and the Duchess of York Sarah Ferguson arrived this morning for the first day of work at Christie's. It is not a full-time job, however, but a six-week work experience position at the prestigious auction house. The first line of that article is horrible. Fergie is what she is, but I think that Prince Andrew does a lot of work. Congratulations to Eugenie on her job! I hope the experience will be useful for managing the Queen's collection. Her grandmother does have a lot of very valuable artwork. Actually I think both Sarah and Andrew work hard. It just isn't appreciated by the general public and the press hatred doesn't help. Wow...What an amazing experience this will be for Eugenie and it dovetails so nicely w/what she's studying at University too. I wish her an amazing summer at one heck of a fantastic Summer Job. I see the normal nastiness that are typical regarding articles on the York Princesses are abound in the comments section of the Daily Mail. Eugenie and Beatrice really can't win. She goes to clubs, fashion shows and she is a rich parasite. She gets a internship via her family connections (something that is done by many rich and poor) and she is accused of not really working and taking someone's job. You don't think she needs a bodyguard, and yet the paper feels the need to report all of her activities so any loon in Britain (and beyond) can find her. Who does that?! I really deplore the sensationalism that accompanies articles regarding the York Princess (or anyone for that matter). What happened to just reporting the facts good and bad and letting people make their own judgements? People are making their own judgments, the papers will have their own tilt but most people are not going to be convinced one way or they other, they have their opinions set. There are plenty of positive comments it's just that the negative ones catch the eye because a lot of them can be pretty wicked in their complaints. I notice how many comments on the article about Eugenie are about her appearance. Then I read this one: "If she were beautiful you'd all love her." There seems to be some truth to this, because look how many critical comments Eugenie gets just for not being properly dressed/looking overweight. I have this feeling that I have no fashion sense myself, because some of the things the York girls wear actually look okay to me, but in this case I can see why people are attacking Eugenie's clothing. It doesn't look like it fits, and she looks dowdy instead of professional. In my perfect world, people would judge people for their fashion sense in one compartment of their brain and judge them for their character in another compartment, but since I don't think that's going to happen any time soon, I feel like Eugenie and Beatrice would be wise to invest in some kind of fashion advisor if they want to win the PR battle. Not that this would necessarily help, since if people can resent Eugenie for getting a job after criticizing her for not having one, they can resent her for just about anything. I think that part of the problem is that Eugenie and Beatrice aren't known very well as individuals, and so people judge them by their image--which, unfortunately, includes some rather strange clothing choices. Perhaps this will change once they're finished school and start their working lives, whatever they decide to do. Then they can be judged on their own merits and not just by how they look or who their parents are. I notice how many comments on the article about Eugenie are about her appearance. Then I read this one: "If she were beautiful you'd all love her." I feel like Eugenie and Beatrice would be wise to invest in some kind of fashion advisor if they want to win the PR battle. They'd be attacked for "wasting tax payer money", they can't win until they're out of Uni and working. I honestly think the extreme negativity surrounding them will tail off when that happens, there will be those who still attack them getting jobs because of contacts but they'll be earning their keep, or as much as they can.